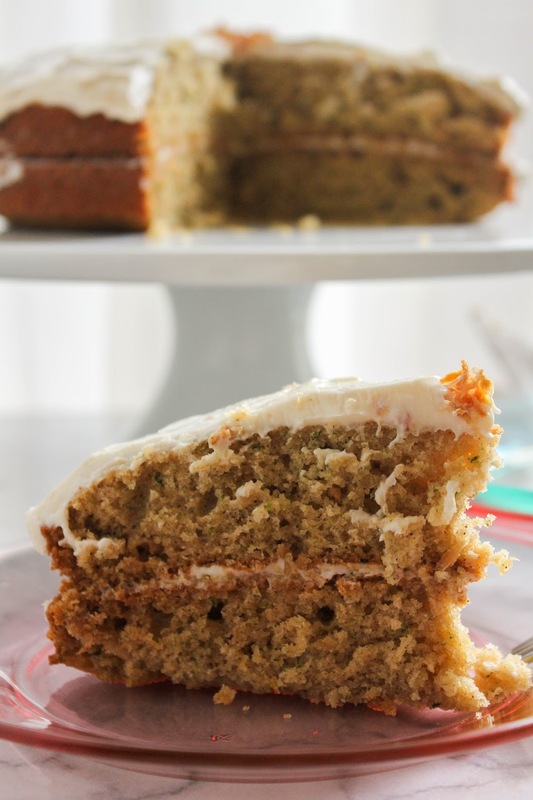 Tender, moist, and packed with flavor, this Zucchini Ginger Cake is a MUST make recipe! There's been an abundance of zucchini around my house lately. I've been getting it in my weekly produce delivery, as well as picking some up at the local grocery store. From eating it fresh to roasting it and sometimes shredding it and putting it in other dishes, my family and I have been loving it all. About a week or so ago I decided to shred up some zucchini and make a zucchini layer cake. 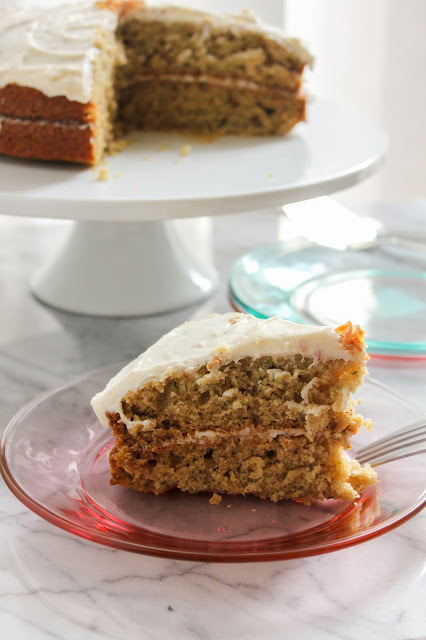 But this isn't just any zucchini cake. 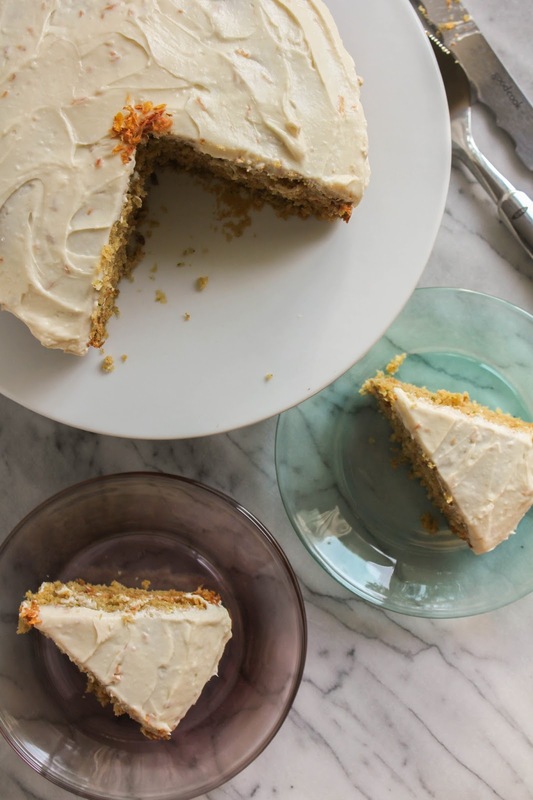 This cake has delicious, spicy ginger in it as well. Gourmet Garden has a new line of lightly dried herbs that are out of this world. They take fresh herbs and dry them just enough so that they last for 4 weeks once they've been opened. The flavor and aroma of Gourmet Garden Lightly Dried Ginger is almost exactly like fresh ginger. In fact, I like it even more and prefer using it over fresh! The cake is moist and tender and I love the spiciness from the ginger. The cream cheese frosting is quick to come together and also has bits of ginger running through it. Perfect for a get together or just for your family, this cake is light and refreshing and won't last long, so be sure to hide a piece or two for yourself! Preheat the oven to 350 degrees. Spray two 9-inch round cake pans with baking spray and set aside. In a large bowl, whisk together the flour, gingers, lemon zest, salt, baking soda and baking powder. In a medium bowl, whisk together the zucchini, olive oil, honey, eggs, and vanilla. Make a well in the center of the dry ingredients, add the wet ingredients, and mix well until just combined. Divide the batter evenly between the prepared cake pans. Bake until the cakes are golden, and a cake tester inserted into the center of a cake comes out clean, about 30 minutes. Cool the cakes in the pans for about 10 minutes, then remove them from the pans and allow to cool completely on a cooling rack. While the cakes are cooling, make the frosting. In the bowl of a stand mixer, beat the cream cheese and butter on medium speed until smooth. Add the powdered sugar, then the vanilla and ginger. Beat on high until the frosting is light and fluffy. Place one of the cakes on a platter,top side down, and spread a thin layer of frosting all over the top. Add the second cake on top and press gently. Spread the rest of the frosting all over the top of the cake, allowing it to drip down the sides as well. Cut into slices and serve. Disclaimer: I received Gourmet Garden products at no charge to use in my kitchen. All opinions are my own.